As an innkeeper and homemaker I have always been baffled by the mattress industry. Did you ever have a mattress salesperson give you a straight answer? The more you shopped, the more confused you got. Recently Rick and I ventured out to buy a new mattress. Just by chance we stopped in at America’s Mattress in Scarborough, Maine which just happened to be next door to a golf shop, (guess where we shopped first)? We were greeted by a salesman who turned out to be the answer to my mattress shopping dreams. He was smart and boy did he know his business. He had great questions which helped us narrow down our choices to three mattresses and we were able to make a choice and purchase within 30 minutes. Hallelujah! Because I was so impressed with our salesman, Ed Walters, I decided to give him a call and interview him for this blog posting. I thought if he could be helpful to individuals choosing a mattress than he would most likely have some good advice for innkeepers when purchasing mattresses for the wide variety of body types that seek that ‘heavenly, blissful and perfect sleep’ in your inns. I had many more questions for Ed, but decided to keep this blog posting short and not too complicated (like mattress shopping!). What I got from his statements is that the main ingredients to consider when purchasing a mattress is support, comfort and durability, all three of equal importance. Also, looking for a good quality medium firm and medium compression topper is a smart choice for the many body types that seek a comfortable sleep in your inn’s beds. And don’t skimp on the quality, you don’t want to have to replace your mattresses every 4 years! But a very important ingredient in our viewpoint at The B&B Team is finding a person like Ed who gives great customer service and a company you can trust and feel comfortable working with. This is something we at The B&B Team also strive for. Time is a most precious commodity with innkeepers and having the service that Ed provides for his hospitality customers is priceless and timeless. Do you all know what fairytale the picture depicts? This entry was posted on Monday, June 28th, 2010 at 8:00 am	and is filed under Innkeeping Business, Market Trends, Operations. You can follow any responses to this entry through the RSS 2.0 feed. Both comments and pings are currently closed. Great article Janet about two important things…good nights sleep and good customer service. 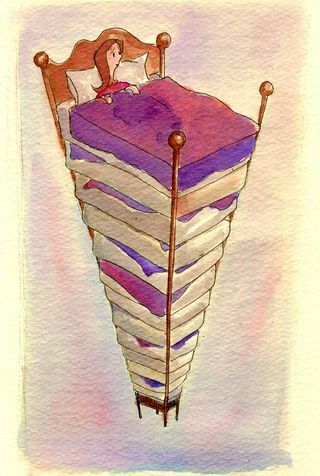 Had the princess in the Princess and the Pea been sleeping on mattresses that Ed recommended she might never have been able to prove herself a true princess. Back several decades ago every mattress ad shouted Super Firm, Xtra Super Firm, up to Super Dooper ultra Firm as everyone wanted to avoid the sag in the middle (especially if the man outweighed his wife by 100 plus pounds and Queen was also the new size to get. Innkeepers with antique beds enlarged these to full and had one or two queens in top-of-the-line rooms. Now everyone wants softer and softer and kings are the norm in upscale homes so guests no longer will sleep in full size beds no matter how soft or firm they are. We eliminated most complaints by adding 2 inch “Swedish foam” toppers and put the thickest cotton pads on top (to stop sweating). To replace 13 mattresses at once was a budget killer but this temporary fix has held up for more than 10 years. We only buy the best Sealy pillow tops to replace old mattresses with the foam tops and have no complaints anymore. When guests ask where they can get such great foam pads we say both K-Mart and Wall-Mart sell these same foam toppers now for about $100 depending on the thickness you need. So if your old mattress is still firm and not sagging (plywood fixes this problem) just buy the topper and save yourself up to $2,000 per bed. One other thing to consider are the health concerns related to traditional mattresses (mattresses made with flame-retardant chemicals). Latex or organic mattresses and bedding are a great, natural option and they do a great job providing the three key aspects of any mattress – support, comfort durability.